After learning this week about Sarasota City Attorney Robert Fournier’s limited involvement in the drafting of a proposed agreement for a nonprofit organization to manage a 53-acre city bayfront park, the City Commission decided to wait until April 15 to consider a final version of the document. Four of the five commissioners made it clear that they wanted to have Fournier review the agreement and provide comments on it before they vote on it. In response to points they and Fournier made on March 18, A.G. Lafley, startup CEO of the Bay Park Conservancy (BPC), told the commissioners that the Conservancy board would be agreeable to a delay. “I think we should stay criteria-driven and not schedule-driven. … I would rather wait two weeks [beyond the original April 1 deadline] and have a shot at a 5-0 vote to make it … easier for us, together, to go to the county, the state and the federal government” to raise funds for The Bay. 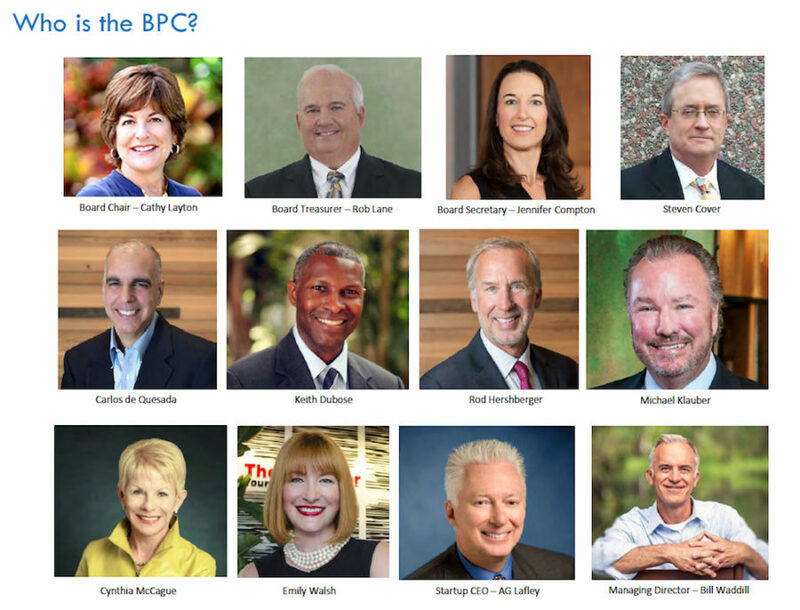 Lafley served as chair of the BPC’s precursor, the Sarasota Bayfront Planning Organization (SBPO), as it raised $2.1 million from philanthropists and community foundations for the creation of the master plan for The Bay. Continued private funding is necessary to the project’s success, he emphasized again on March 18. Lafley is the retired executive chair and former CEO of Procter & Gamble. To facilitate completion of a document that would be satisfactory to the commissioners, he asked them to extend until April 15 the interim agreement they approved with the SBPO on Oct. 1, 2018. 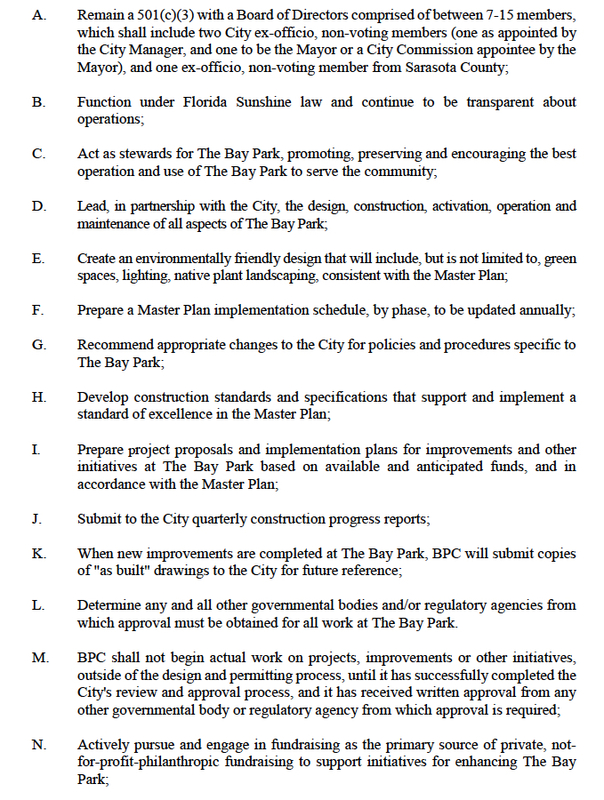 That document was designed to allow the SBPO to transition into the Bay Park Conservancy (BPC) as nonprofit work continued on the first phase of The Bay, as well as on the formal agreement laying out the terms for the Conservancy’s partnership with the city for at least the next 15 years. The interim agreement was set to terminate on March 31. Commissioner Willie Shaw made the motion for the extension, and Commissioner Shelli Freeland Eddie seconded it. The motion passed unanimously. Several times during the discussion, City Attorney Fournier raised his voice as he responded to board members’ remarks. He explained how the process to craft the final agreement with the BPC had not evolved as he had anticipated. At one point, Jennifer Compton, an attorney with Shumaker, Loop & Kendrick in Sarasota and a member of the BPC board, talked of how she could craft a new section of the document regarding financial expectations for the nonprofit and the city as each phase of The Bay master plan is ready to unfold. “That’s the plan,” City Manager Tom Barwin interjected. When Commissioner Hagen Brody then asked why Fournier had not spoken up during the board’s Feb. 4 discussion of the “term sheet” guidelines for the agreement, Fournier responded, again in a raised voice, “Because of this!” as he gestured toward the four representatives of the Conservancy seated before the commission that afternoon. Among them were Lafley and Compton. “It always was our intent to make sure that whatever came back [to the commission] for final review was going to go through the City Attorney’s Office,” Barwin said. Mayor Liz Alpert was the only commissioner this week to emphasize an unwillingness to delay the completion of the formal agreement. “I think we continue to delay it, we lose the chance of getting support … from [private] contributors [and] other governmental entities that are concerned about our commitment to making this happen,” she said. County Commission Chair Charles Hines last week raised the issue about the City Commission’s failure to provide unanimous support for The Bay in most of its votes. He cited that as one reason the County Commission was not prepared during its March 13 meeting to agree to help fund the project. “I do not feel comfortable moving forward with anything that our own city attorney has not dug through,” Vice Mayor Jen Ahearn-Koch said. Ahearn-Koch also concurred with Freeland Eddie on the need for specific financial details of each phase of the master plan as they have been completed. Commissioners Shaw and Brody, too, talked of the need for Fournier to review the final partnership agreement between the city and the BPC. “The responsibility and the accountability lays upon this commission,” Shaw pointed out. Opening the two-hour discussion on March 18, City Manger Barwin explained that efforts had been underway since 2007 to transform “what is probably the single largest parking lot in the city into an attractive green space” that would draw people during the day, as well as at night, with a variety of activities proposed on the 53 acres. They include art exhibits, fishing, mangrove tours, dining options and educational opportunities, BPC Managing Director Bill Waddill has explained. 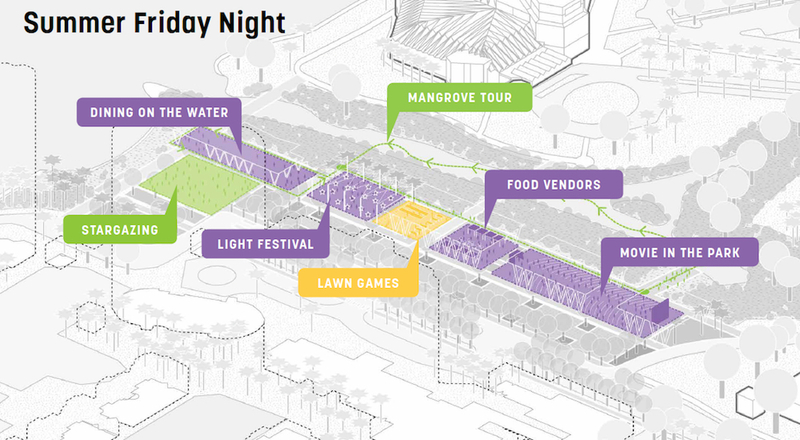 Before the SPBO was created, Barwin noted, the nonprofit Sarasota Bayfront 20:20 worked to gain community support for a new vision for the city’s waterfront. 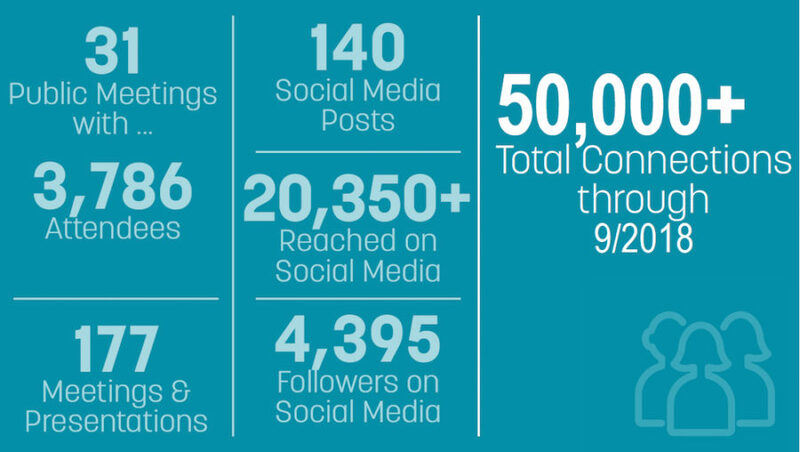 After it took over the initiative, the SBPO hired an internationally known, Boston-area design firm and conducted numerous community meetings and online surveys in an effort to create the master plan for The Bay, Lafley pointed out. The Bay Park Conservancy (BPC) was planned by the SBPO to manage operations and raise funds for new park and cultural and arts amenities on the city property. On Sept. 6, 2018, the City Commission approved the overall design of the project, which was presented by SBPO leaders and representatives of the Boston-area firm, Sasaki. 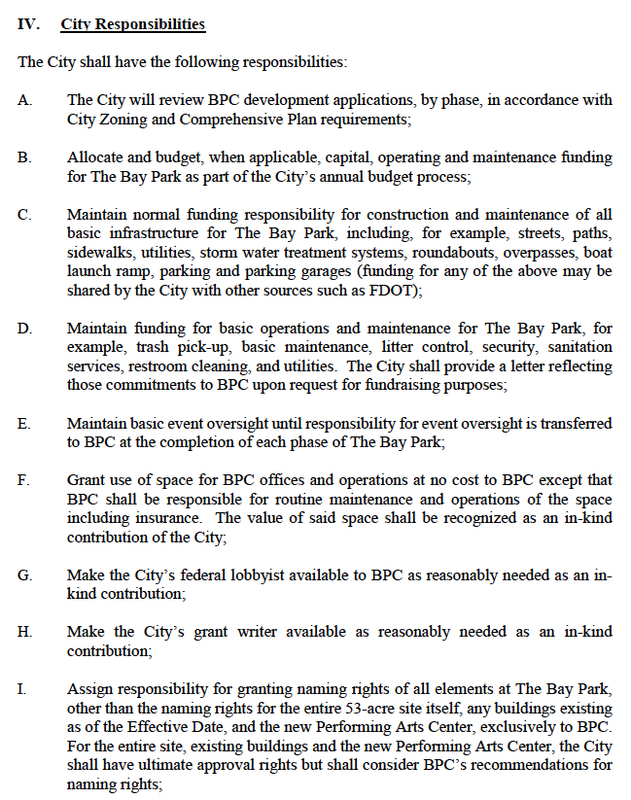 As he began his remarks on March 18, Fournier explained that he had understood that a number of meetings of city staff and representatives of the Bay Park Conservancy would take place, to work on the “term sheet” that would provide a general guideline for the final partnership agreement between the city and the BPC. He had expected the City Commission to hear a report in early January about the progress on the term sheet, he continued, which would allow the commissioners the opportunity to provide comments that could be addressed as the work proceeded on that document. He also had anticipated, he added, that as a result of commission direction, the material would be turned over to him and his staff for completion of the term sheet. However, Fournier said, “What happened along the way [was that] an extra month was needed” before the term sheet was ready to be released. When the commissioners finally addressed that document during their regular meeting on Feb. 4, he pointed out, “Valid [concerns] … about the term sheet” were aired. “There wasn’t direction given” to him, he added, to address concerns in preparation of the final agreement. After the Feb. 4 meeting, he continued, he called Compton, the BPC board member, to explain, “I sort of felt hobbled” without any specific commission comments for him and his staff to act upon at that point. 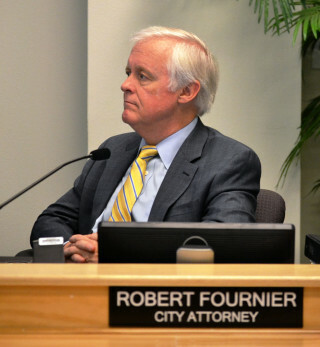 On March 18, Fournier also referenced community residents’ concerns about the Feb. 4 term sheet and the draft of the formal agreement prepared for the meeting that afternoon. A number of residents voiced surprise last month after learning from the term sheet that the city’s financial involvement would be much more extensive than indicated in past discussions about The Bay. Previously, SBPO members emphasized philanthropic contributions as the primary funding source for the project. On March 18, Lafley stressed that it was impossible to know how much The Bay would end up costing, as its completion is expected to take 10 to 15 years. However, he said, the expense has been put between $100 million and $150 million. “We continue to believe that more than half of the capital funding for the first phase [of the project] will come from private, philanthropic sources.” The target, he said, is $8 million; it could be more or less. Another facet of the project will be a new performing arts venue. That has been estimated at $250 million, but BPC representatives have explained that the Van Wezel Foundation is in charge of that initiative, including the fundraising for it. The BPC also expects money for The Bay to come through a new City of Sarasota-County of Sarasota tax increment financing (TIF) agreement. Yet, county commissioners last week pushed back on that idea when Waddill, managing director of the Conservancy, and Cathy Layton, the BPC chair, discussed The Bay with the county board members. During the March 18 meeting, Lafley indicated that the BPC is counting on $5 million from a new TIF to help pay for Phase One. With a TIF district, the tax value of property within designated boundaries in a specific year is set as the baseline. Then, as the value of the land rises, the resulting increase in property tax revenue is diverted to a fund for use in that district. Fournier told the city commissioners on March 18 that if they wanted “a non-appropriations clause [to] be included in the [formal agreement with the BPC],” he could insert such a clause. 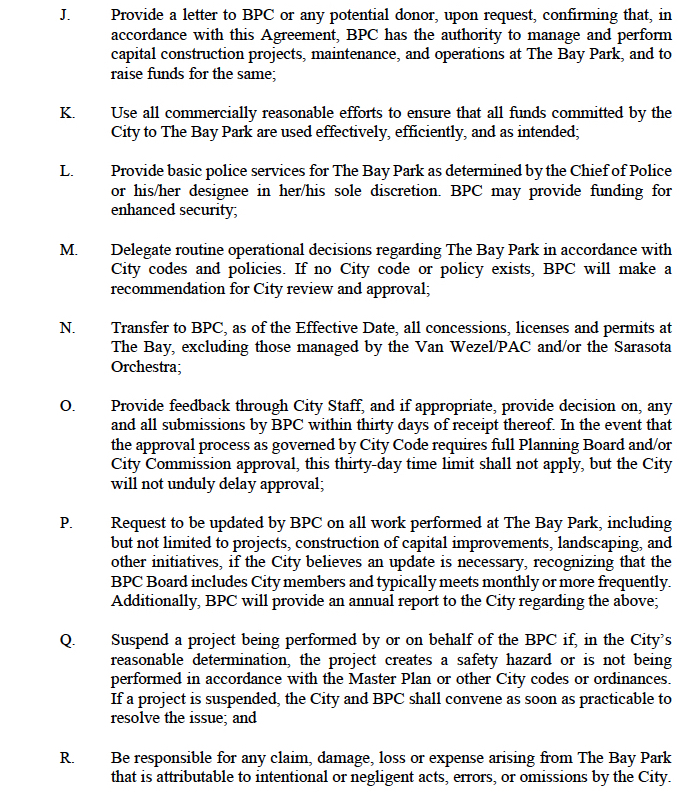 Fournier also said the commissioners might agree that all they want in the document is language indicating that the BPC should undertake its best efforts to raise money for The Bay, without any measurable fundraising goals being required. Commissioner Freeland Eddie was the first commissioner to call for details in the agreement about the financial responsibilities of the commission and the BPC, as well as timelines for city funding to be incorporated into budget planning. Compton of the BPC board said she could make sure the final agreement includes a framework for such information to be provided to the commission as the details are developed for each phase of the project. BPC leaders indicated the master plan will comprise six or seven phases. The first is expected to cost $15 million, Lafley told the commissioners; its completion is anticipated in 2021. 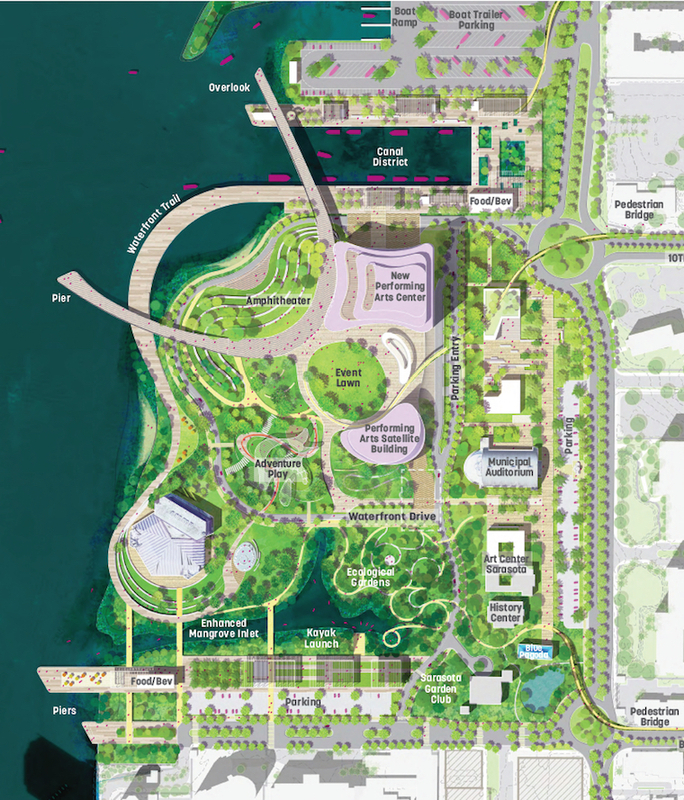 That phase includes a recreational pier, along with a pedestrian crossover of U.S. 41 to 9 or 10 acres of the southernmost portion of the city’s 53 acres. Fournier also told the commissioners he had concerns about “the specificity of some of the delegation of authority” from the city to the BPC, as proposed. Another issue, he noted, appears to be the need for language to be inserted into the final agreement to ensure the BPC adheres to the state’s open meetings and public records laws. Fournier further expressed worry about trying to complete his review of the proposed agreement in time for the commission to address it, as planned, on April 1. The deadline for all agenda material for that meeting was noon the following day, he pointed out. And, as he understood from earlier comments, BPC Managing Director Waddill has made handwritten notes on the draft agreement, reflecting more changes to be incorporated into it since that document was made public in advance of the March 18 meeting. “If I really had my druthers,” Fournier said, because he had not been as involved in drafting the agreement as he had anticipated, “it would be nice to have a little more time …” Perhaps the commission could wait until its second meeting in May, he continued, to vote on the agreement. “I do not think it’s impossible” to finish the agreement by April 1, Compton of the BPC told the commissioners.